Did you really expect that I could have a whole month of How Tos, Tuts and Giveaways WITHOUT some Copic tuts? Well, we’re going to have a whole week of fun! I’m happy to have some help in the big undertaking this week by some girls that you might know… Zoe, Amy and Melissa! Copic Queens all 3! I’m looking forward to what they have to share! 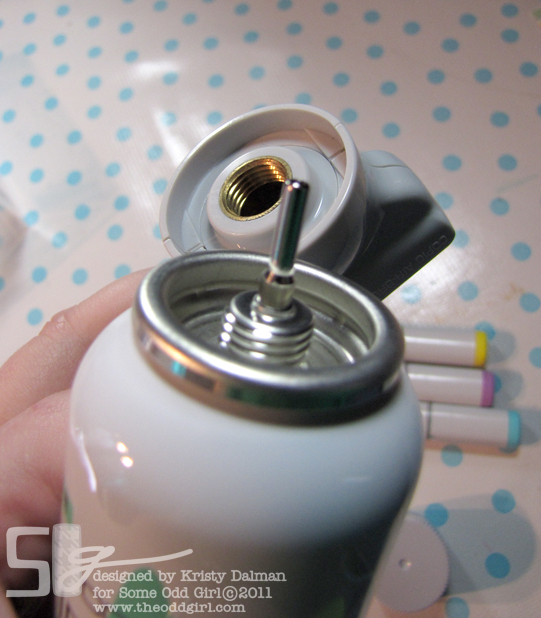 Today its my turn though and I have a little share about the Copic ABS, AirBrush System. 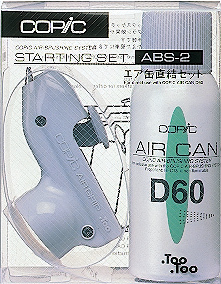 The ABS-2 comes with the Copic Airgrip and a small can of compressed air. I’m saying small because it has about 7-8 minutes of air in there, it may not sound like alot but it can get you far! 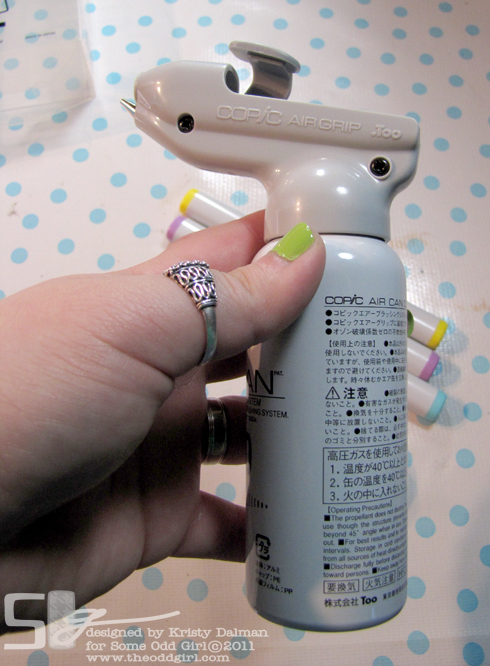 Also, if you’re not sure if you’ll enjoy airbrushing its a great place to start because you can by bigger cans or go up to an actual compressor using the airgrip included (plus some bits sold separately of course). Once you get your goodies out of the box and do a little giddy dance (I did… just assuming you will too :mrgreen:) You’ll take the air grip and the upwrapped, unlidded can or air. The two are made to go together so screw it on but not SUPER tight, snug though. Screwing it too tight may cause leaks or damage to the can or airgrip. Now if you’re anything like me you play a good minute of bang bang cowboy with your new awesome gun to “make sure” the air is coming out. After that its time to pick a marker (original or sketch) and get ready to play! 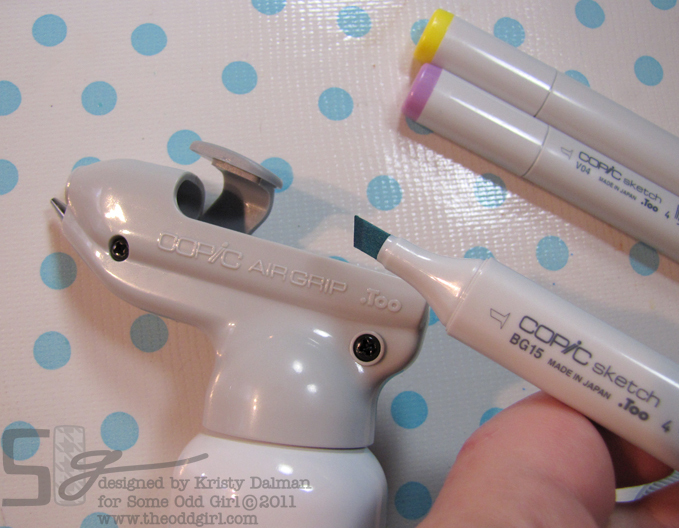 You’ll insert the broad end of your marker into the airgrip with the point up top. After that you are ready to pick a target or “project” and get your spray on! Airbrushing can use alot of ink if you are really layering it on, just be aware . 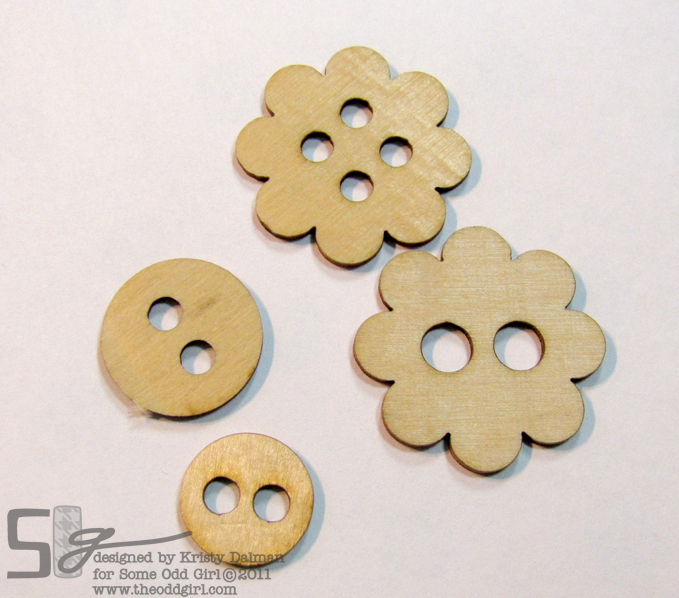 For this example I’m going to spray these wood veneer buttons from Studio Calico. Hold your Airgrip (gun hehe) at about a 45 degree angle. For these little buttons I had to put a dot of adhesive on the back so they didn’t blow away… some good air pressure in that lil can! I sprayed with BG15, RV04 and Y35. Love how you can still see the woodgrain after they’ve been sprayed! They have a shimmery look to them too. Doesn’t the paper I put down look cool? Masking is another fun to do with the airbrushing! No clumping like some sprays, a bonus 🙂 You can airbrush any of the same things you might color with your copics… paper, glass, buttons, brads, wood, chipboard, transparencies, paper flowers, twine, masking tape, etc etc etc. Really pretty much anything you can think of! I then just used the buttons on a quicky like project. Now I have a matching embellie for my card! I would keep the box the system comes in for easy and safe storage too. Unscrew, pop the cap back on the can of air and back in the box. Being Copic week and all we NEED a giveaway! So I have a Copic ABS-2 to giveaway to a lucky commenter! To be entered to win you must tell me what you would airbrush with it. Be creative and specific! You can enter all the way thru October 29th and we’ll announce the winner on Oct 31 in our massive candy winners post 🙂 Don’t forget too to link up in the badge linky party up top on the right for a chance to win some random candy! Our first random candy winner was Denise! I’m going to be sending her out a suprise gifty in the mail real soon! You could be next so just grab the badge and link up! See you back here bright eyed and bushy tailed for some more Copic goodness! i would do lots of small rainbows om a wall at home!!! Hmm Maybbe om a Canvas to!! have test airbrusching at artscool years ago!!! and would love to have one!!! must write it on Santa’s list..
Great tut, you are right the directions are not done well. When I got mine,(I started with this) I used up pretty much all of the air just getting it to work. This is great for anyone just getting started with it! goodness what wouldn’t i do with it? I’m thinking tie dyed unders and matching bra sets for starters. This is definitely going on my Santa wish list this year… along with the real markers so I can use it!! Great how to! Great tutorial! The airbrushed look is so amazing when I have seen it done on projects. They look so professional and polished. 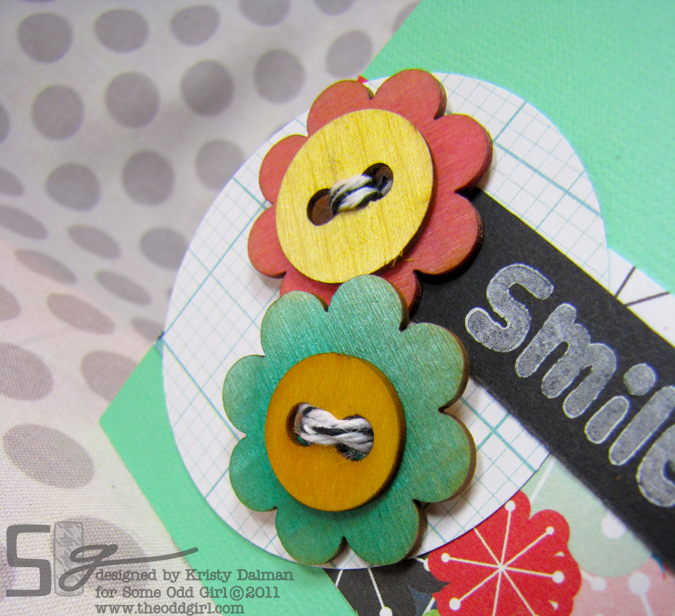 I LOVE the designs on the paper you had under the wooden buttons. 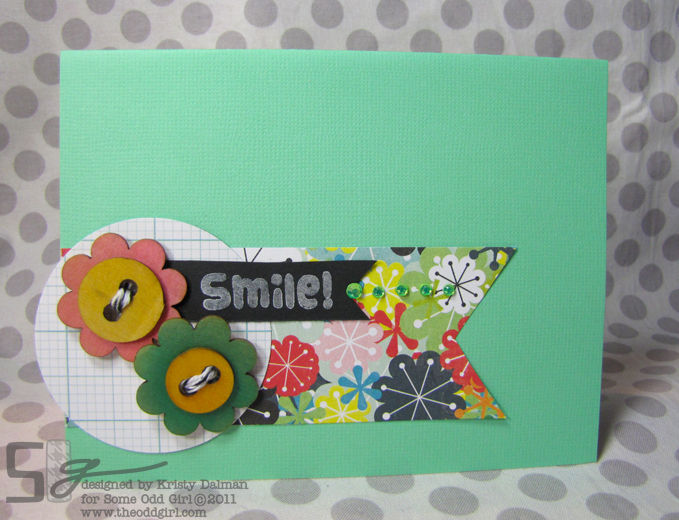 What a fun idea for a background page! Wow what a awesome tool!!! Great tutorial too!! Those buttons are so fun on that card!! 🙂 Thanks for this! HOLY WOW! I just kept waiting for the next picture to see this thing in action! Wowzers too cool! Def on my wishlist now! Thanks for sharing! 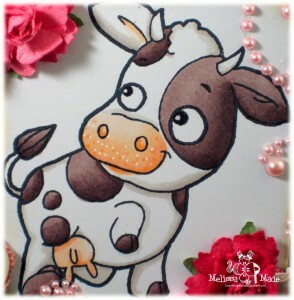 What would I airbrush…….backgrounds, chipboard……flowers…..! You name it I’d try it! Thanks for the chance Kristy! Love my airbrush system- so much fun to play with. I would colour flowers and chipboards with it. That is a great tool. Love the airbrush look! I would love to try this technique on the Pink Paislee mistables paper and embellishments that I picked up recently! Thanks so much for the tutorial! hmmm…I’ve been wanting to invest in one of these since I knew what amazing things it can do. So I’m thinking Christmas right now…With a airbrush set I would want to scrap up a wooden frame…airbrush the edges with a vintage look, paste a nice colored paper that would match, air brush little embellishments such as snowflakes, Christmas tree, reindeer’s, snowman to add to the piece. I would also like to add “Penguin love Tia” in the corner to add a little focal point. Essentially I would use the air brush technique to add a little vintage feel to the overall look of the frame. Wow to win this would be amazing. I could Air Brush Flowers, buttons, backgrounds……. That is cool. I have never seen one so thx for the tut! I would love to try this on paper or fabric flowers that are handmade. Ithink that you could get some beautiful variations in color. Thank you for the quick tutorial, and sample. Love how it colored. I would use it on Christmas flowers, and cards. The shading would be beautiful on larger flowers. Thanks forthe chance to win. I know that giddy feeling after I found mine for 40% off at Micheals. So thrilled that they now carry Copics. Haven’t used it yet, but can’t wait to play. Love the card. hmmm this is hard… what would i colour? I’ve seen it but never dare to use it! You have upped my longing to get one for me now. Thanks for the tutorial. I’ve seen it but never dare to use it! You have upped my longing to get one for me now. Thanks for the tutorial. Would love to color chipboards, glass and wood veneers. I think I would airbrush chippies with it. Thanks for the chance. okay that is so neat! i would totally use it to make scenes for my cards with! how cool would that be?? I think I would airbrush some masked butterflies on the background of a layout in rainbow colors. Looks totally fun!! I love my copic air brush. Thanks for showing me a new trick. I can’t wait to try it. 😀 Its a crazy color… matches my comforter AND my sons fav blankie (he takes it every where). Thank-you for a picture tutorial, I have a slower connection so most videos are out for me! I would use it on canvas, ribbon and doilies for my cardmaking. Thanks for the chance to win! What would I airbrush?? Hmmm, well everything 🙂 I would like to try it making backgrounds by putting a shape down to block some space to keep white. I would also like to try it on white prima flowers. I would try it on all kinds of things to experiment. I have been thinking of getting one, so I would love to win it! Thanks for the chance. Cool! I didn’t know you could use the regular markers to airbrush. You’re awesome for sharing this! Thank you!!! What a cool new toy/gadget/tool! Besides scrapbooking/card-making, I’m into polymer and air dry clays. 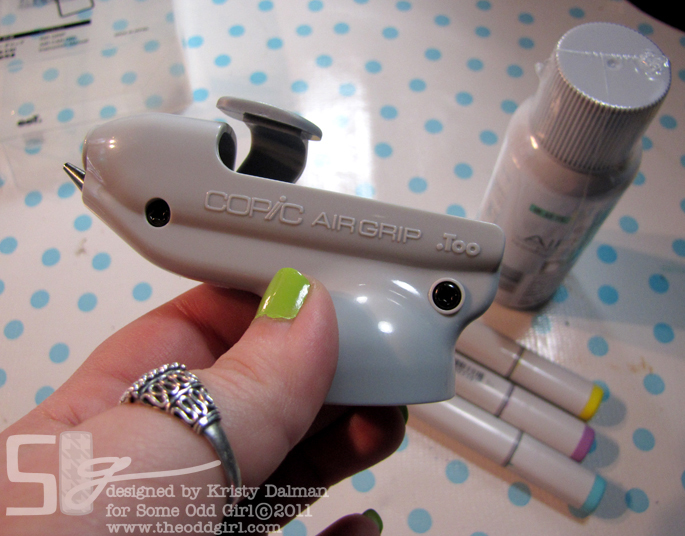 I’d love to use the airbrush to color some of my creations – I make flowers, teapot houses, ornaments, and recently little buttons/charms to decorate my cards and gift tags. What wouldn’t I airbrush is a better question. But What is the first thing I would airbrush? Embellishments for cards. 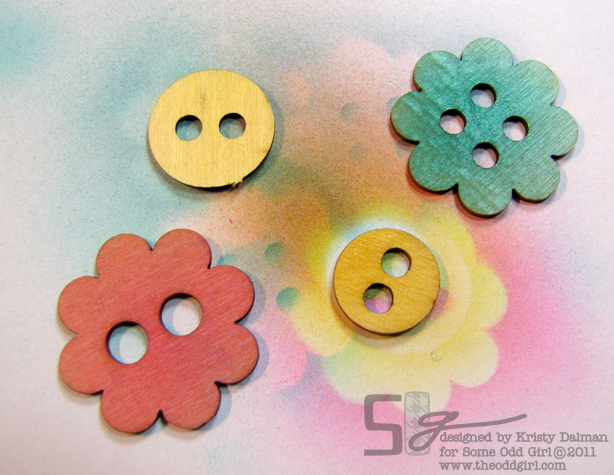 wood buttons like you did, masked card stock for backgrounds, flowers like prima or those I made myself with my Tim Holtz tattered floral die. OOOOOH that looks like fun! Would love to win one. Thank you for the chance! Such a cool tut- thanks!!! I would color chipboards! I’m cleaning out my craftroom and finding a bunch of them and have been putting them in my donations pile. Now I’ll be digging them up cuz I know I’ll love the look of the spray on them! Would use the airbrush on lace. The lace I bought are mostly white or ivory color, I can then turn all my lace into the perfect copic color to match my image or card stock! Wow…I have see other use this but thought it was way above my talent but you made it look doable……I think I would take advantage of coloring all of my embellishments to match what I am doing and not worry about buying the right color. I could buy everything in white and be done with it knowing that I would always have the perfect color match. Thank you so much for this tutorial… If I do not win I might have to ask Santa for it…. OMG I would love to have this! Looks awesome! I’d br airbrushing everything in sight! Guess I’d start with some flowers, though, and work my way on from there! SUPERB, what an item, I would use one for EVERYTHING, sunrises, sunsets, tie die, shoot, think i could color my dog? 🙂 Only kidding!! So many things to experiment with!! Would love to be owned by one of these babies. Thanks much for the chance!!! The first thing I would try to do is color an image background by keeping a nestie in place to create a white frame around the background. I have always liked that effect. This looks really cool, but I have to admit I am still umming and ahhing over getting one, mainly because I would be worried it would chew through your ink. If I do get one, then I would use it to airbrush lace and use the lace on cards and also the lace patterned background. I would also like to use it with masking on a stamp to create a halo effect around the image. I think it would be great for a wall art canvas too! Hmmm, I’m new to this, but I do love the masking. Maybe just for sky, grass, and water backgrounds to start… then I’d get more adventurous after that. 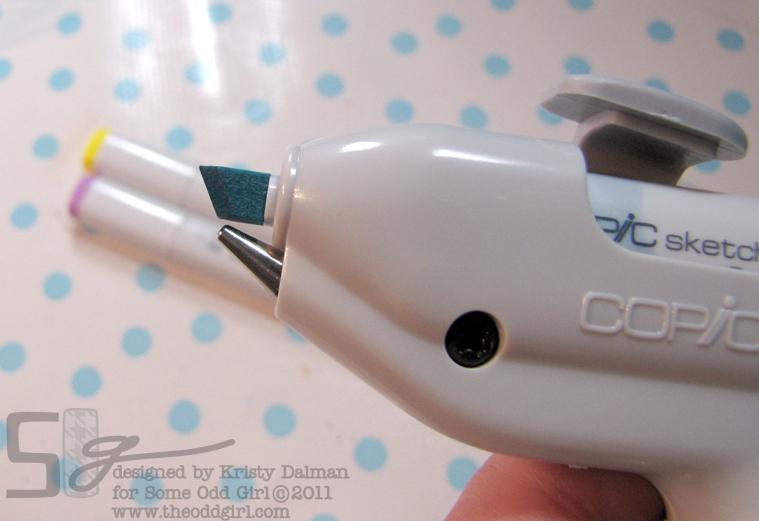 I never took the time to see how the Copic AB system actually works. This is such great information to have and to see how easy it really is! I like to alter wooden picture frames. I could see me using the AB to alter my frames in a different way. I’m going to look into that! Thanks for the chance to win one. Happy birthday Kristy! this looks like fun – I would airbrush around the edges of my paper, like some people do sponging, I think the effect is great! I would airbrush my shoes! They would be one of a kind! 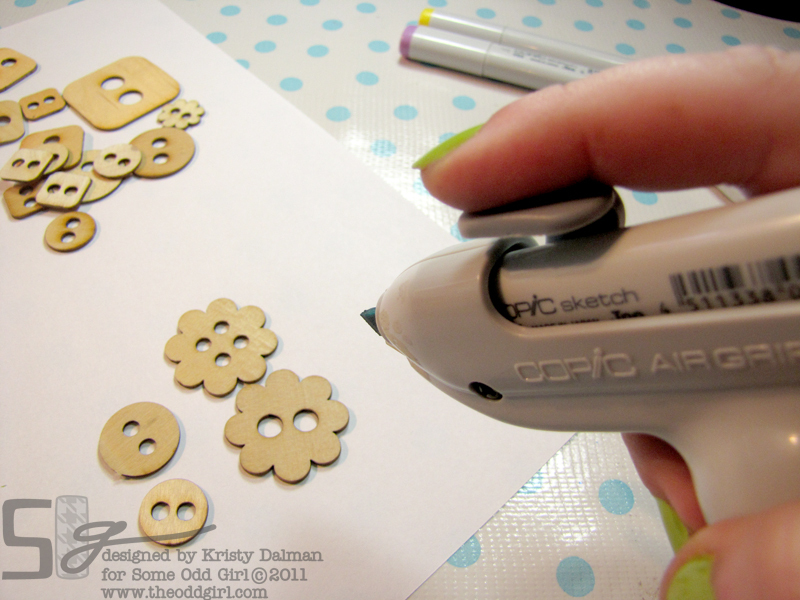 I would cut out vinyl stencils with my cricut, then airbrush my cricut! Fun! I “neeeeed” this! Please help me! I always think of backgrounds when I see the airbrushing tool, but am thrilled to see you coloring wood buttons! EEK…I would like to airbrush, everything, LOL! What would I air brush, well, EVERYTHING!! Kids watch out. hehe!! I would love to win this, it would be SO much fun. Ohhh nice! 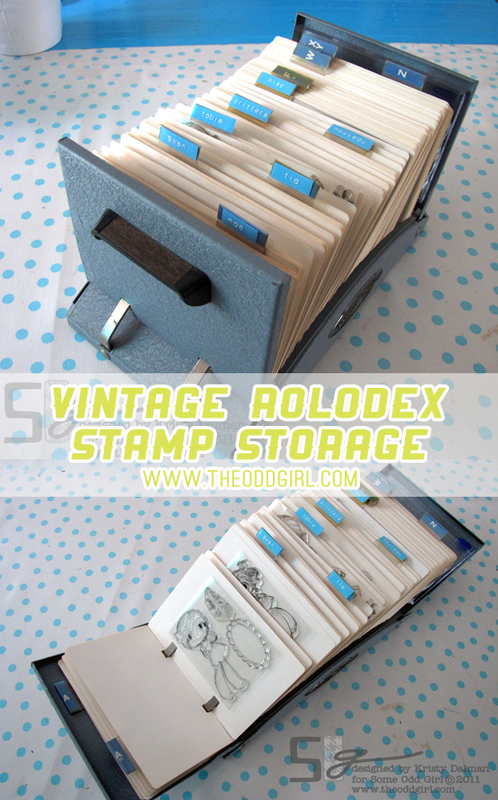 I could definitely use one of these to color embellishments, flowers, ribbon, backgrounds, and tons of other stuff! Wow This looks like an uber cool toy. It would be great for canvases (which is what I would use it for) I love abstract painting and the airbrush system would be great with that technique. Ps, Great nail polish color.